This is an oral combination of bioavailable B vitamins i.e L-methylfolate, methylcobalamin, and pyridoxal 5'-phosphate for improving epidermal nerve fiber density (ENFD) in the lower extremity of patients with diabetic peripheral neuropathy (DPN). Provides nutritional requirements needed to restore metabolic processes associated with diabetic neuropathy to maintain blood flow by increasing nitric oxide resulting in vasodilation. 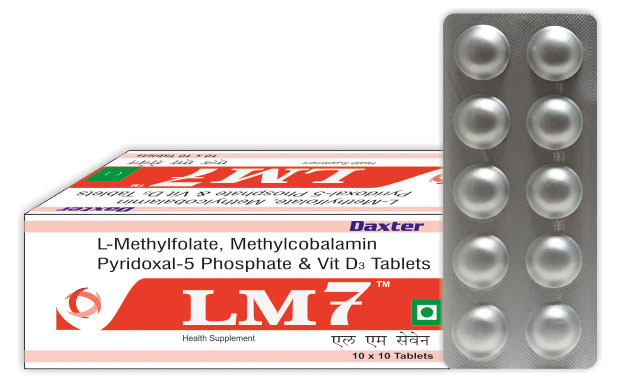 L-methylfolate Primary biologically active isomer of folic acid and the primary form of folate in circulation; folic acid is a precursor of tetrahydrofolic acid, which is involved as a cofactor for transformylation reactions. Pyridoxal 5′-phosphate (PLP) Active form of vitamin B6. Methylcobalamin One of 2 forms of biologically active vitamin B12. These tablets are indicated for the distinct nutritional requirements of patients with endothelial dysfunction who present with loss of protective sensation and neuropathic pain associated with diabetic peripheral neuropathy. It is the potent form of vitamin B12, a vitamin that has strong effects on the brain and nervous system being also very important for cell growth and production. It is neurologically active form of the vitamin B12. Methylcobalamin is used in variety of processes, including: production of red and white blood cell, the regeneration of RNA and DNA, synthesis of proteins, nerve cell and sheath maintenance and maintenance of bone marrow. It is used in treatment of the peripheral neuropathy, diabetic neuropathy, and people deficient in vitamin B12. L-methylfolate is novel form of folate and is more effective than folic acid. The administration of l-methylfolate has been associated with increased levels of nitric oxide vasodiator, thereby increasing blood flow to the peripheral nerve tissue. Furthermore, l-methylfolate possesses antioxidant activity in addition to stimulating the production of nitric oxide synthase. It is a critical factor in the reduction of ser um homocysteine levels, which studies have noted to be elevated in patients with diabetic neuropathy in comparison with patients with diabetes without neuropathy. Pyridoxal – 5 -phosphate is the active form of vitamin B6 and is used as the prosthetic group for many of the enzymes where this vitamin is involved. PLP is readily absorbed by the intestine by a process which is preceded by dephosphorylation to form pyridoxal. The phosphate group is regained during passage through the intestine. Pyridoxine, the parent compound of PLP and the most frequently used form of vitamin B6, requires reduction and phosphorylation before becoming biologically active. Vitamin D deficiency has been associated with both type 1 and type 2 diabetes as well as both the microvascular and macrovascular complications of diabetes. Vitamin D deficiency has been shown to be more common in diabetic patients who have symptoms of distal symmetrical polyneuropathy. Thus vitamin D3 helps in lowering risk of Vitamin D deficiency; an independent risk factor for diabetic peripheral neuropathy. Methylcobalamin: This includes prescription and over-the-counter (OTC) medications, supplements like vitamins and other dietary supplements (nutritional shakes, protein powders, etc. ), herbals drugs. Some medications that have serious interactions with Vitamin B12 are: Chlorambucil, Omeprazole, colchicines. Pyridoxal-5-Phosphate: Drugs including Aspirin, anticoagulants ("blood thinners") such as Warfarin or heparin, anti-platelet drugs such as clopidogrel, and non-steroidal anti-inflammatory drugs such as ibuprofen or naproxen. It may affect blood sugar level also. Vitamin D3 interacts with alumunium containing antacids and digoxin. L-methyl folate calcium interacts with warfarin and anticonvulsants. ● patients with a history of bipolar illness.